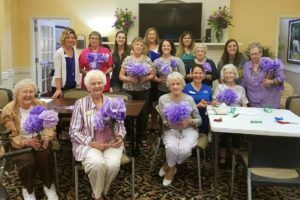 Junior League Volunteers work with highly functioning adults living at the Concordia Life Care Community to educate seniors on healthy food and exercise choices utilizing gardening and engaging activities to keep seniors minds and bodies active. Concordia has two outdoor raised garden beds where JLOC volunteers incorporate curriculum and activities for seniors to plant and care for vegetables, plants, and herbs to then use in making healthy meals and snacks with in-season items from the garden. JLOC volunteers provide gardening tools and supplies for the seniors, and also plan a “planting party” where seniors invite friends and family to sow the seed of a healthy lifestyle!